One of my most favorite things in the whole entire world is cheese sauce. Over noodles (I’d way rather have it drizzled on top of pasta than mixed together), over veggies (just about any vegetable is edible with cheese sauce and mu children agree), with tortilla chips (do I really need to explain?) My conundrum with cheese sauce is that a) I don’t love “cheese product” and b) it’s rarely healthy eating-friendly. This sauce has made my life. I got the recipe from America’s Test Kitchen Comfort Food Makeovers, but I made a few very minor tweaks, all relating to the cheese (because, well, cheese). The original recipe called for low-fat cheddar cheese, and not too much of it. One thing I’ve found in my most recent weight-loss journey is that it is no longer 1990 and dietary fat isn’t the enemy (in most cases), not really. I’ve had much, much more success when I cut down on refined carbs and sugars and don’t worry so much about the fat. It makes our food taste good and, when paired with protein, it helps signal our brains when we’re full. I went for the full-fat cheese and I also increased it a little. 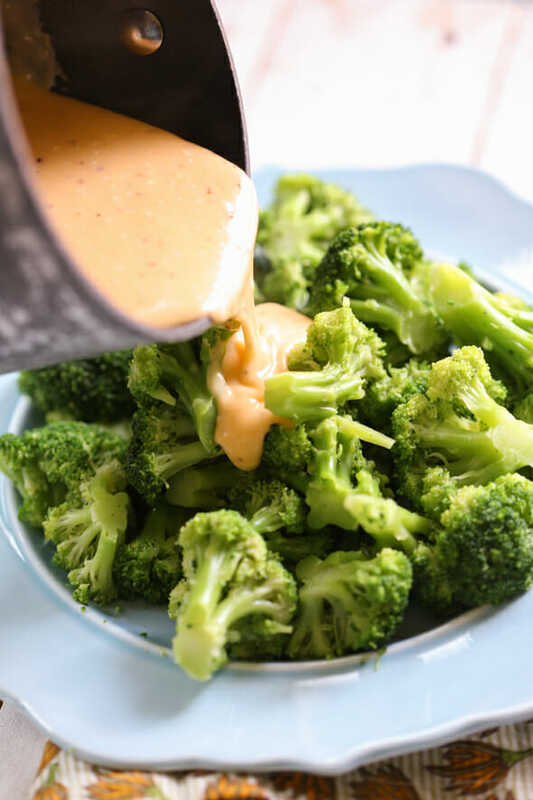 It still comes in at a very respectable 125 calories–If you have 1 cup of steamed broccoli topped with 1/4 of this sauce, you’ve got a 150-calorie mid-afternoon snack. You’re going to need chicken broth, a tiny pinch of cayenne pepper, cornstarch, a little Dijon mustard, some light cream cheese, and 1 cup (4 ounces) of freshly shredded medium or sharp cheddar. Medium or sharp because you’ll get more flavor by using less, and freshly shredded (instead of a bag of pre-shredded cheese) because they coat the shreds with a chemical that results in a weird texture when you try to melt it. zoodles, cooked pasta, baked potatoes, or use it as a dip for chips or like fondue. Makes 4-6 servings. In a small saucepan, combine 3/4 cup chicken broth and the cayenne pepper. Bring to a boil. While the broth is heating, whisk together the remaining 1/4 cup broth, cornstarch, and the Dijon mustard. When it comes to a boil, add the cornstarch mixture and boil for about 1 minute or until thickened. Turn heat to low and whisk in the light cream cheese. 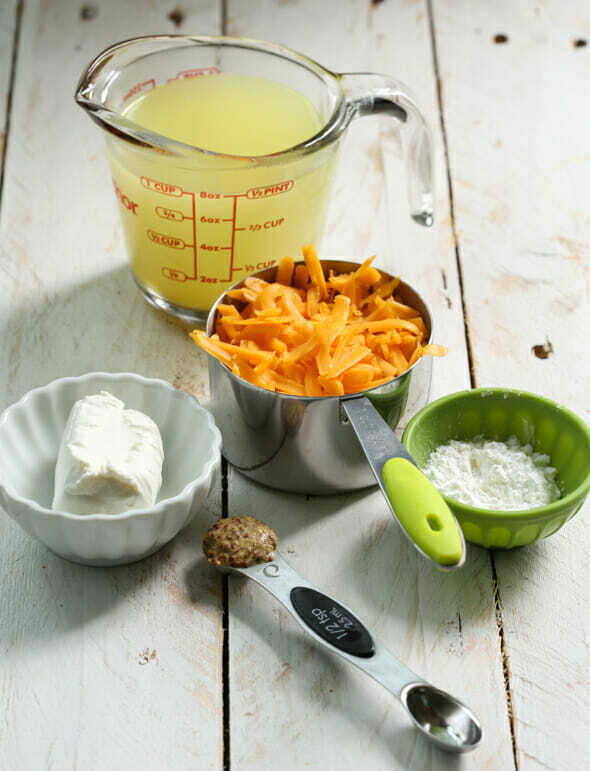 When totally smooth, whisk in the cheddar cheese. Drizzle over steamed or roasted vegetables, zoodles, cooked pasta, baked potatoes, or use it as a dip for chips or like fondue. Makes 4-6 servings. P.S. If you haven’t heart, people are getting their cookbooks THIS WEEK!! EEEK! I don’t think they’re on too many shelves yet, but you can order it from Amazon, Barnes and Noble, Deseret Book, or your favorite independent bookseller. Our olive oil sale ends TODAY! 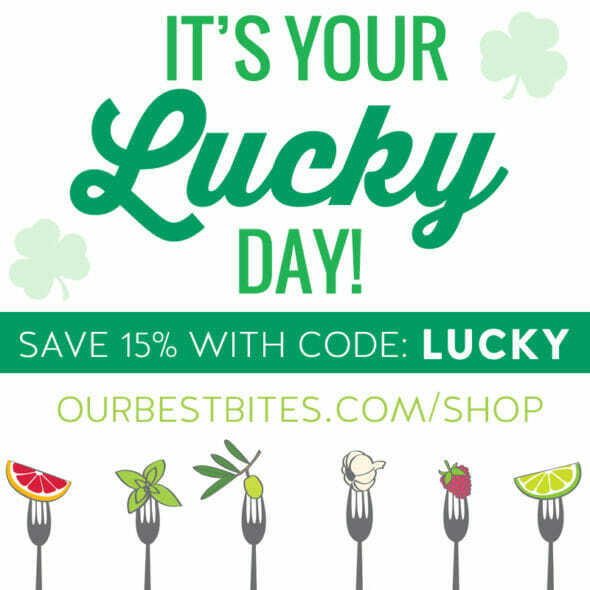 So head over to the shop and use the code LUCKY to get 15% off your order! Alicia- I know from experience with our previous books that right about now things like this happen on Amazon and it’s usually because the books are being freighted to the various Amazon warehouses. Often the status changes simply depending on if books have arrived there or not, or still in transit. So don’t lose all hope- I have a feeling it will be arriving soon, regardless! And that cheese sauce looks awesome, by the way! I am excited to try this! I have done many searches for a good homemade cheese sauce, with no luck. Most call for processed cheese- ugh. Not to take over all the comments, but I just went to make my first-ever olive oil purchase at the OBB shop, and it’s telling me that the code “LUCKY” is expired. Any thoughts? I’ve tried entering it twice. Hey Alicia- sorry that was my fault! The coupon expired yesterday, but I had told Kate we were running in through today. I’ve updated it to extend the coupon code through today though, sorry about hold-up. It should work now! Any substitute suggestions on the mustard? Not a fan but I sure do love cheese! I would just leave it out! 🙂 Or maybe 1/2 tsp. cider or white wine vinegar. Guess who just got her cookbook??? I’ll gladly look through it tonight – can.not.wait. Do you mean that 1/4 cup is 125 calories, or 1/4 of the entire pot is 125 cal? About how many cups of sauce does this recipe yield? Thank you so much for this recipe! I love cheese sauce, but because of the calories I have stayed away from it. With this, I can have it back 🙂 Thank you! I would love to see what a day’s worth, or a week’s worth of eating looks like for you. I struggle with breakfast and lunch – mainly it’s hard to actually take the time to cook anything at those times of the day 😉 I know I need to up my protein and decrease my carbs, and I do try to stay away from simple carbs, but carbs are definitely the simplest and easiest! 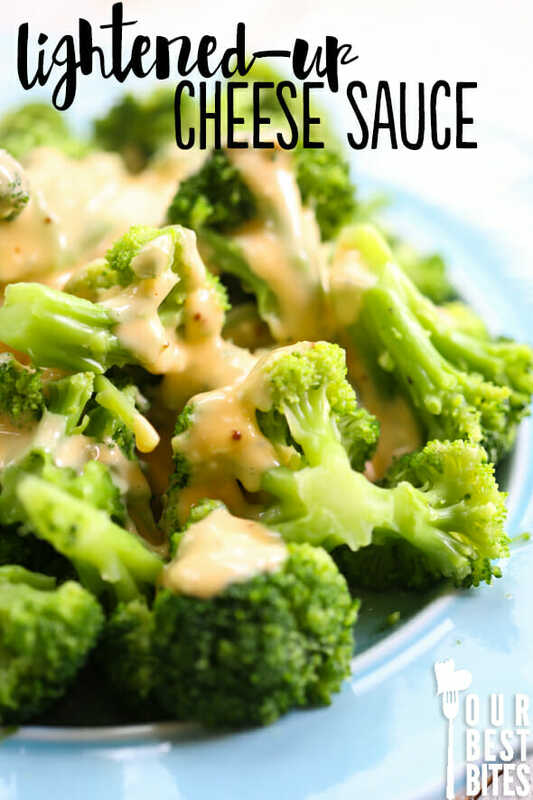 I love this cheese sauce idea! I bet it would taste pretty spectacular with a can of rotel for some nacho sauce. What about hard boiled eggs or a protein shake? This is awesome! I have been looking for a cheese sauce forever that doesn’t have junk in it! Wow I NEEDED this recipe. Thank you!!!! Sounds tasty. This is kind of similar to your alfredo sauce, which I have made with cheddar instead of parm and used for mac & cheese. I’ll definitely try this version of it. once again you hit a homerun! 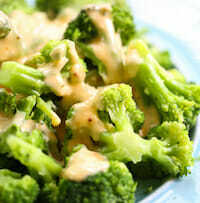 took your idea with the broccoli and put it all over a baked potato for dinner – yummy!!!! Trouble with go green on eating? Here lighted up cheese sauce come’s to save the day. Veggie and greasy in the same time? What could be more wonderful? This is irresistible!!! How many ounces of cheese? I used a 1 cup dry measure and it wasn’t enough cheese. I used medium tillamook cheddar and it definitely tasted like chicken broth. I made this the other night, and now my family isn’t complaining about “broccoli again!” So delicious! Made this for our baked potato bar tonight. It was so good, I licked the pan clean when we were done. It tasted great over the mixed veggies, ham, and potatoes with greek yogurt. Make your own chicken broth. boil whichever chicken parts you have or want to use with salt ans pepper. This looks amazing, definitely will give it a try! And thank you very much for including the WW points, I adore you for that! 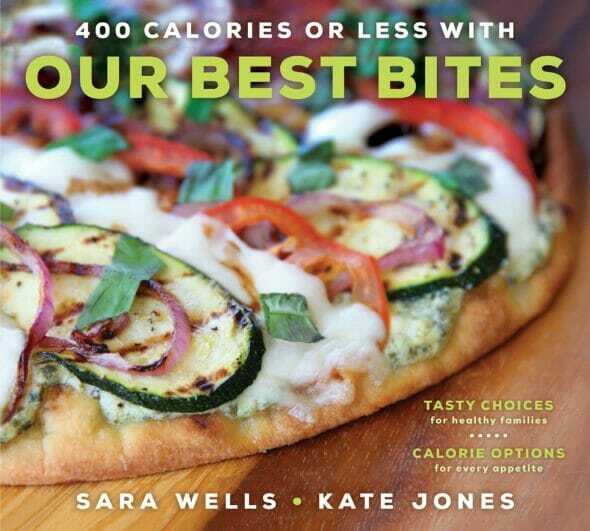 ❮ Previous Post Previous post: New Our Best Bites Book: 400 Calories or Less!